Last week Addis Ababa was host to the 16th International Conference on AIDS and STIs in Africa (ICASA 2011). Registration costs were pretty steep, but a few weeks ago I made it my goal to find a way to attend. I called the organizers and explained my project and situation and asked politely for a discount. The harried woman on the phone told me that since the conference was just days away they wouldn’t be able to accommodate my request. Then, on the advice of a colleague, I tried to worm my way in as a volunteer. This method actually resulted in success fairly quickly, but then another, better opportunity arrived and I jumped on it. I have been volunteering/interning/hanging out (it’s difficult to qualify what I actually do) with the Young Women’s Christian Association (YWCA) of Ethiopia. They have several programmes for girls and a very friendly, welcoming staff. Just four days before the conference began Sabe Haile, the YWCA General Secretary of Ethiopia called me and surprised me by saying she’d convinced the World YWCA to sponsor me for ICASA! I would be part of the World YWCA’s delegation, which included young women from eight different member associations: Angola, Benin, Ethiopia, Kenya, Rwanda, Sierra Leone, Tanzania, and Zambia. As a member of the World YWCA delegation, I was also required to attend the pre-ICASA meeting they were hosting in the two days preceding the conference’s opening session. I had been assigned the role of small group facilitator and worked closely with the two representatives from Angola and Tanzania. The big topic of the weekend was how to ensure girls’ sexual and reproductive health rights (SRHR) are upheld. SRHR cover a broad range of topics but include important issues such as ensuring access to contraceptives, privacy in clinical settings, protection from sexual violence, the ability to choose whether or not to marry, and more. The World WYCA is interested not only in protecting and strengthening SRHR, but also empowering young women to become advocates for these rights on a local, national, and global level. 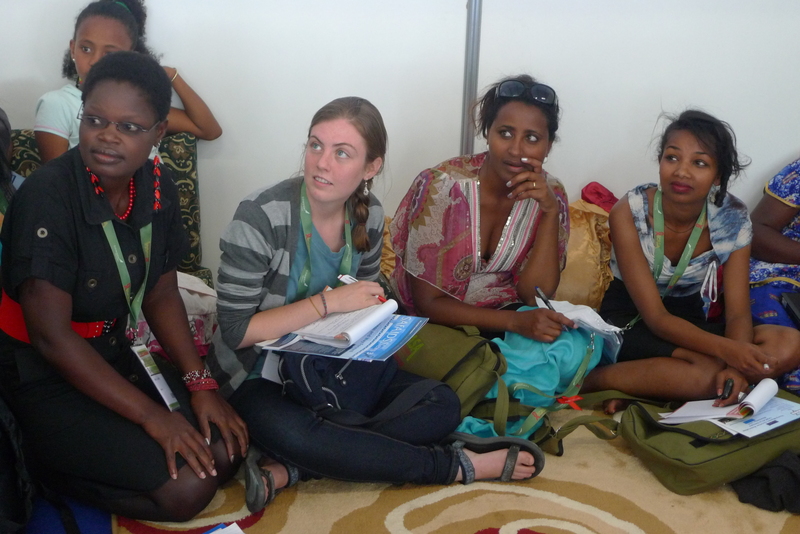 The young women in attendance (ranging from age 16 to 30) shared successful SRHR programs from their own countries. While this all was unfolding, I realized I had stumbled into a new safe space. Obviously I was excited to attend ICASA. I was interested to learn more about HIV and AIDS in the African context, see how gender and youth concerns were a part of the larger agenda on HIV and AIDS, and perhaps pick up a few contacts for South Africa. Entering the conference as a part of the YWCA team, however, added an extra dimension to my time there. For a little while I wasn’t a solo traveler interested in safe spaces for girls, but part of a larger group whose members were interested in the gender dynamics at play in the AIDS epidemic. If I am being honest, it took me a few days to grasp just what a privilege it was to be asked to participate with this particular group of young women. They were a diverse group; they differed in age, in background, in level of involvement at the YWCA, and in language. Initially, all these differences were a challenge to navigate. The conference was in English, but everyone’s comfort level with the language varied and I wasn’t always sure what had been successfully communicated and what had gotten lost in translation. It is now clear to me that the World YWCA created a safe space by allowing this diverse group of young women (myself included) to participate in ICASA as one unit. Safe spaces, as I have said countless times in the last few months, bring girls together to build their social networks and teach them new skills. This, in turn, empowers them to improve their lives and the lives of those around them. Well, that’s definitely what has happened over the last week. Although just last Friday most people in the room were strangers, there is now a strong bond between the participants. While the YWCA certainly invited these delegates so that they would disseminate the information they learn here with the people at home, it is important to recognize that some of the most important lessons did not come from the conference presenters. Instead, it originated in the conversations that sprang up between these young, African women who wanted to share what the situation was like in their country. During the conference, the YWCA hosted an inter-generational dialogue on how girls and parents relate on matters of sexual and reproductive health. As I sat listening to what my new friends had to say about their experiences I was reminded why I find this project so exciting. For me, there is nothing more dynamic or energizing than hearing young women speak out, confidently and clearly about the challenges they face and work together to find a solution.